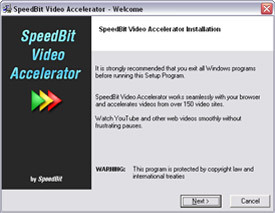 Download SPEEDbit Video Accelerator and then run the installer application. In the activation window, select the I already have a premium activation code option. Enter your email address and the activation code you received into the appropriate fields, and then click Next. 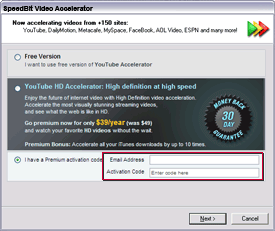 Note: If you have already installed SPEEDbit Video Accelerator, you can open the activation window by right-clicking the SPEEDbit Video Accelerator system tray icon, and then clicking Enter Activation Code.